Sheena is packing up the boys (all 4 of them) and flying off to the motherland! She is excited, hesitant and insanely nervous all at the same time! Samir has a lot of extended family in Mumbai and they have been asking to meet the boys for 6 years now and Sheena and Samir have always tried to push if off saying, “We will come next year.” Well, the year has finally come and they finally pulled the trigger and booked the flights. That was the easy part, booking the flights, but now comes the hard part, actually going!! Although Sheena and Samir have been to India a ton of times, they have a laundry list of hesitations going with the kids for the first time. Luckily they are staying at her in-laws house in Mumbai verses a hotel, which will be very helpful. Sheena and Samir decided on flying with Emirates via Dubai and spending a few days there to visit family and friends. This will be a nice little break for all of them and the boys will get to explore a new country! They figured if they are flying all the way there they might as well get another quick trip in. With that being said, it is still a 13 hour trek to Dubai and to just imagine the kids holed up on a plane for that long is excruciating. They get stir crazy in a single family home, the plane is going to be interesting to say the least. They decided on an evening flight so that the kids can entertain for the first half of the flight and hopefully sleep through the second half. Sheena is banking on the in-flight TV entertainment to keep them busy for the most part. Other than that, she is packing their ipads (of course), coloring books, crayons, small games (like spot it, uno, etc), cars and of course legos! As for food, she herself doesn’t like airplane food, so she will be packing a few meals and snacks for them during the ride. Fingers crossed it’s smooth sailing all the way through. This will be an interesting adjustment. With the vast time change (India is 10 hours and 30 minutes ahead of us), they know that adjusting to the new timing will take a few days. They’re really not looking forward to their tired, cranky and up all night kids for the first couple of days. And of course, as soon as they get used to the timing there, it will be time to come back, so that is going to be another challenge they will have to deal with. This is Sheena and Samir’s biggest hesitation in taking the kids to India. It’s tough enough that all of us adults get sick when we go there because we get so excited about eating everything! They have heard 100s of stories about friends’ kids getting sick, diarrhea, vomiting, and dehydration because the kids weren’t as careful about the water, food, etc. They have also heard of many kids going and coming back completely fine, but lets be serious, who ever remembers the good stuff??!?! Sheena has tried to remind the boys that they are not to drink the water, put their hands in their mouths, touch everything and anything they see and most importantly keep applying hand sanitizer as often as possible. But of course, they are a bunch of 5 and 6 year olds, since when do they have ears that work? She is expecting them to do ALL of the above and that is terrifying her! Two of Sheena’s boys have nut (peanut and tree nut) allergies and until now she has been able to keep them under control. Here it seems everyone is aware and more informed about nut allergies and is considerate of them. In India, nut allergies are not as common so people in general are less sensitive to them (that is her impression – she may be wrong). For example, our own mom, when the kids first got diagnosed with the allergies, didn’t truly believe they had the allergies and thought the doctors were just putting it “in our minds.” It was frustrating to make her understand even though we understood where she was coming from as this was the first she had ever even heard of a food allergy. Well, she lived and learned when she gave Shaan hazelnut and he broke out in hives all over his body. India food has a lot of nuts in it. With that being said, Sheena is terrified that even if she asks about nuts in the food, people may just say no there are no nuts without truly knowing. Her plan is to pack food from home when they go out and hopefully the kids will stick to that only. But again, a bunch of little boys and their curiosity will be the end of her. Of course, she is packing her own little pharmacy just to be on the safe side! At home, in Mumbai, we are all set with an American style potty, so there is nothing to worry about there. However, in India, the method of going to the bathroom is squat and do. Even though most places are changing to a standing potty, some places still have the potty in the floor. THANK GOODNESS she has all boys and they only have to stand and go, however if they have to go #2 on the road…god help her! She is packing tons and tons of anti-bacterial sanitizing wipes! Sheena’s boys LOVE milk! Sheena and Samir went back and forth about either taking Organic Valley or Horizon milk boxes with them to India or trying out the Nestle A+ milk from India. They have heard mixed reviews from people about that and most people (to be on the safe side) have just steered clear of all dairy while there. You would think that since it is only 3 weeks no dairy would be fine, however, they just love their milk. Taking milk from here to there for all 3 weeks, for all 3 kids for all meals would mean they would need to pack 3 suitcases of just milk. Yikes! Therefore, they have decided to take enough for them to have milk once a day and steer clear of any dairy over there. Better safe than sorry. A fear that still exists is that if someone offers them ice cream or yogurt, they may jump on it. Sheena has told them several times that they have to ask Mommy or Daddy about anything they want to eat before eating it. Hopefully they remember. Ugh these pesky little things are going to be the end of Sheena. She is a huge target for them and is always bitten up and down, even in America. With all the diseases going around with these little guys, Sheena has taken every precaution she can think of to avoid any of them getting bitten. She has mosquito repellent spray, patches, wrist/ankle bands, tea tree oil and plug ins ready for them. She is also packing pants and long sleeve shirts (even though it will be 90 degrees) and fully covered slip on shoes. Sheena also went back and forth about giving the boys Malaria tablets while we travel and finally decided on giving it. She was nervous about all the side effects however the doctor mentioned it is always smart to be preventative than reactive, so she decided it would be better to take that precaution. Let’s be serious, when anyone first goes to India, it is a complete culture shock. The three of us were completely shocked our first time (we were in high school the first time we went so we understood our surroundings) and are still in shock every time we go. It is something that one can never get “used too” experiencing. Throughout the years, we’ve seen such an amazing transformation of the country, it surprises us every time we go! For the kids, it’ll definitely be surprising to see cows on the streets, stray dogs running around, beggars coming up to the cars, kids on the streets with no parents… But we’re excited and eager to teach them about how other people live! It’ll be eye opening for them, and hopefully instill a sense of culture and pride within them that we feel we experienced when we came to India for the first time. You’re probably reading this and thinking Sheena has lost her marbles and needs to calm down, and that hundreds of people take their newborns to India without any issues. You’re probably right, but we thought there might be even one other parent out there who has the same fears and insecurities and thought we’d share Sheena’s feelings to give a sense of commonality. Of course Sheena is more excited than scared to take the kids, she can’t wait for them to meet their extended family and visit new cities and temples, see the culture and where their grandparents grew upl. She knows it’ll be a great time for them all and will definitely share her story when they return! Stay tuned for the “After Math” January 2017! Remember when we shared our Favorite Places to Visit in India? Great idea to take malaria medications……don’t want to scare you but one of our relative in PA passed away from what he was treated of flu, but after death report said it was malaria…..he travelled to India 10 months ago and was bitten and apparently malaria germs live in your body and can come back anytime within 2yrs of time period…..who knew!? I was debating on traveling with my infant but later decided not to as she is too small….. Wish you a fun & safe journey!!! Making the same trip, same airline, this friday with a 5 month old and a 3 year old. Amazon India prime has been a lifesaver! My comment above makes me sound like a nut job! I swear we all have a really good time in India and I’m not as militant there as I sound! :). You’re going to have a blast! Hi! 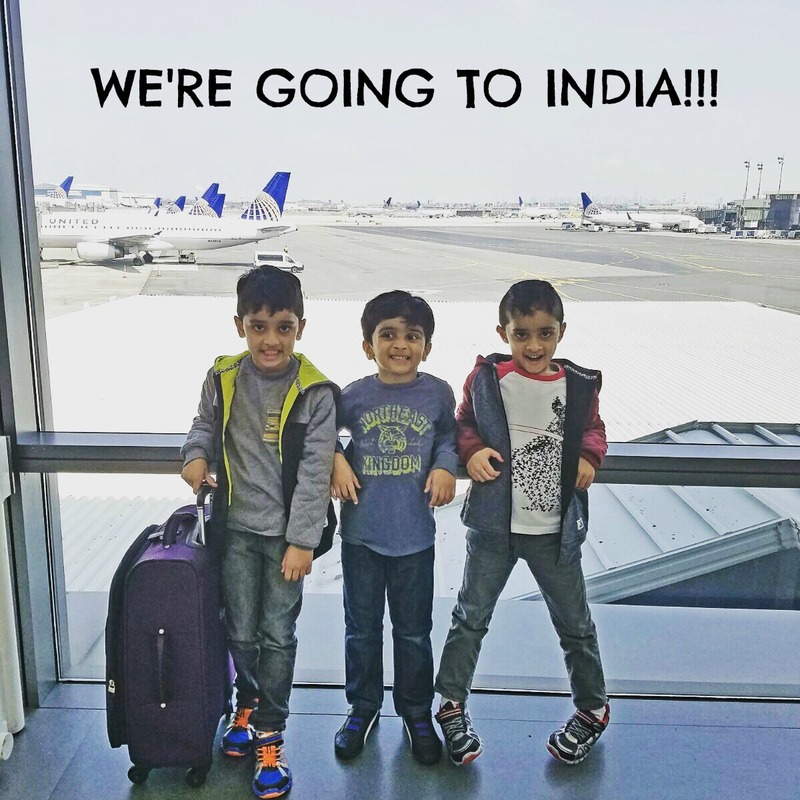 I have 8 year old twins that we’ve taken to India every two years, sometimes every year, since they were 13 months old. Despite that I still get anxious about going, especially about them getting sick. We stay with family but also travel during our trip. We try to eat hot fresh food from homes we know or good hotels. We’ve taught the kids the importance of only drinking bottled or boiled water, and only if we give it to them or say yes to it. Lots of people there will tell me “it’s filtered water, it’s okay.” No thanks! We also have them brush with bottled water and give them baths so they don’t accidentally drink any… Oh and they have Amul Tetra packs of cows milk there which is what we use, mostly for cereal though. And take bug spray. It’s hard for me to relax in India but as the kids get older it’s getting easier. And the overall experience is amazing!!! My kids love India!